A Highlands Country Club Wedding is a unique and beautiful experience. The club and garrison were established as privately held estates in the 19th century, with an old world elegance about them that remains today. The venue’s grand ballroom also only holds up to 150 guests, which makes for an intimate atmosphere for newlyweds. The Highlands Country Club Wedding pictured, took place in the fall. Fall weddings have a certain allure to them, as the sky begins to darken earlier and the air becomes crisp. This atmosphere makes for some of the most captivating photographs. In this picture, I walked the grounds of the club with the couple, posing them amidst the fairy-tale like country scenes that surrounded us. 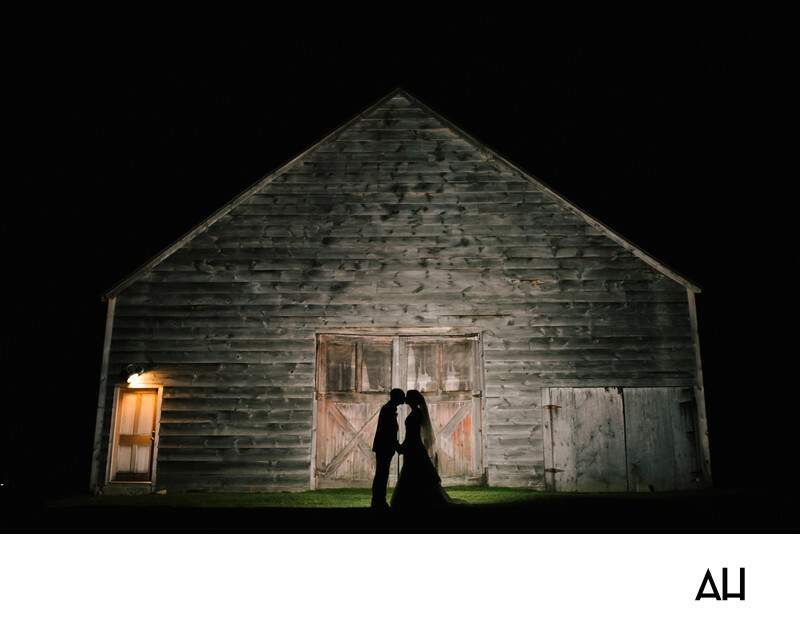 For the photo, I instructed the couple to stand in front of a barn and lit the front of the building with a flash to turn their images into silhouettes. Contrasted with the textured, vintage siding of the barn and the wood-stained door that frames them, the bride and groom paint a picture of classic romance. The moment feels enchanted, and with the night sky surrounding them it is as though I am documenting an old love story. The couple feels separate from me and from the world, as they stand holding hands and leaning in for true love’s kiss.